This immaculate style is to be expected. Jane is an accomplished draughtswoman; however neither accuracy, on the one hand, nor imagination on the other, is enough to create a masterpiece. The elements of the picture must build not only a unity of design but weave a tapestry of meaning. This is where symbolism and suggestion come in, dogs, birds, butterflies, fruit, mirrors, musical instruments, masks, even impassivity itself; all have their secondary meanings, and in Jane’s case, all are part of a narrative thread loose enough to free the visual imagination from the restraints of reason. Not so much de Chirico’s ‘nostalgia of the infinite’ as an almost abnormal serenity of the finite bathed in an even, golden light, like the Venetian ‘oro pallido’’ that suffuses all forms equally, hardly casting a shadow. A trawl of her artistic heroes might give a clue as to how such an individual style developed. There is the stillness of Chardin; the personal vision of Balthus; Ingres’ monumentality; the simple perfection of Roman and Etruscan sculpture; the spirituality of the early Italian Renaissance; the broken narrative and hint of menace from Paula Rego; and of course artefacts from ancient Indian and Japanese art. All of these qualities and influences are recognisable in her compositions, but her approach and the ideas that surface are very much her own. “I take my ideas from anything that catches my eye, also from particularly evocative reading.” No wonder she is so beloved of the publishers. And it was from Salley Vickers’ novel of the same name that she found ‘Miss Garnet’s Angel’, currently on show at London’s Portal Gallery. This haunting pastel is but one of a series of works inspired by the book, a tale of a life reborn in Venice, that floating city of masques and masquerade. The eponymous heroine has an emotional experience in front of a painting of Tobias and the angel Raphael. However this particular angel is a rather surreal version of the species. For Raphael has a wooden body dressed in pink and topped by a mask-like head, not the kind of rugged heroic frame one might expect from the apocryphal version of the legend. His expression is impassive, reminiscent of Piero della Francesca’s figures: an angel lost in thought or dreams. What do angels dream? Jane says of her own work “I do not dream, my paintings are waking dreams”, and that approach certainly fits with the meticulous care taken over both figure and setting. The subject is framed in an arched-window through which the silhouetted rooftop features of Venice can just be glimpsed over the body of an accompanying Dalmatian. It is interesting that in a city which overlooks the Dalmatian coast, Jane should choose this particular breed of dog to fulfil the legendary requirement. It is just another example of how she adds layer upon layer ever endowing the subject with a deeper significance. 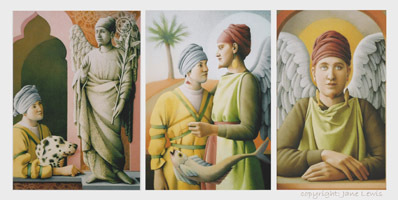 “Two close friends of mine, a couple, asked me to read the book (Miss Garnet’s Angel) and produce a triptych.” It was done in pastels on hand-made paper, and the three parts, ‘Tobias in Venice’, ‘Tobias and the Angel’, and ‘Angel at the Window’ all contribute to the tale. We first see the angel as a statue, which is then brought to life like some modern-day Pygmalion transformed by love. And there certainly is an ambiguity about not only the relationship but the gender of both figures. “My painting has been, throughout most of my career, concerned with the human figure, and as a gay artist I would hope there is sometimes a questioning of sexuality…many of my figures appear androgynous.” The symbols from the legend are all there including the fish, parts of which are used to ward off demons thus saving Tobias’s life later on when he takes a bride. It looms large in the middle section only to be reduced to a pair of earrings in the final painting, which depicts Raphael gazing out of a window. An opportunity missed; perhaps that’s what angels dream about. Jane has recently embraced the Still Life genre. ‘Fragments of the Senses’ is a modern ‘vanitas’, a personal interpretation of the old allegories of the senses. Sculptured forms of individual facial features are rendered in oil on flax canvas. They resemble those vast pieces of broken sculpture that clutter the ruined sites of antiquity. A butterfly rests briefly on top of the fragmented forms reminding the viewer of time passing: an interesting take on the momento-morae theme. The oil painting ‘Oranges’ marks another point on Jane’s canvases where ancient and modern worlds meet. For here in this evocation of her pet cat ‘Tybert’, Jane transports us to the long lost world of Pompeii. The form of the work and the horizontal division of subjects resembles so clearly the Roman approach that it almost could have been taken from a Pompeian interior.